Fax Protocol software provides a comprehensive solution for Group 3 Fax. VOCAL’s fax protocol software is optimized for DSPs and conventional processors from TI, ADI, Intel, ARM and other leading vendors. Our fax protocol software may be licensed standalone, as part of a library or with a VoIP stack for integration with a developer’s application. Custom designs are also available to meet your unique fax requirements. Contact us to discuss your Group 3 fax/facsimile application requirements. Group 3 fax devices conform to the ITU-T T.4 and T.30 Recommendations which manage the procedures used for image conversion and fax transmission. This includes the T.4, T.6, and T.30 protocol stacks. Included as well is the T.30E module, which is necessary for the transmission and reception of colour fax. Group 3 fax “high speed” modulations include V.17 (14.4 kbps, 12.0 kbps, 9.6 kbps, and 7.2 kbps), V.29 (9.6 kbps and 7.2 kbps), and V.27ter (4.8 kbps and 2.4 kbps). V.33 is no longer specified as an option under T.30. T.30 specifies an additional 14 modulation rates between 2400 bps and 33600 bps (in increments of 2400 bps) that can be used from the V.34 modulation. This is referred to as V.34 Fax. As with V.34 data modulation procedures, V.8 startup is required. 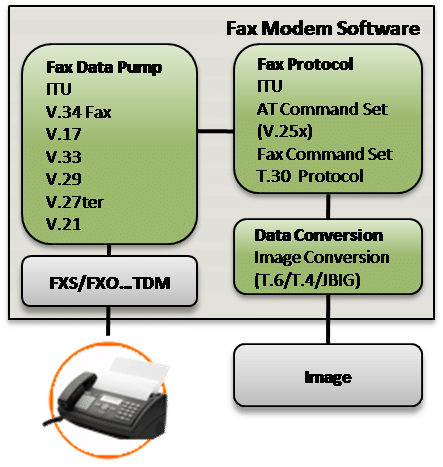 V.34 Fax includes procedures for full and half duplex data channel operation; half duplex is mandatory for V.34 Fax support. In non-V.34 Fax, V.21 is used to transport T.30 control information frames. V.34 half-duplex procedures define a 1200 bps and 2400 bps control channel. In V.34fax, this control channel is used to transport T.30 control information frames. The use of error correction mode for V.34 Fax is mandatory. The binary coded signalling system is based on a High Level Data Link Control (HDLC) format developed for data transmission procedures. This provides for frame labelling, error checking, and confirmation of correctly received information. Error correction mode is optional for some fax image formats (T.4) and mandatory for other compressions (T.6). Other features of Group 3 Fax include image compression algorithms such as T.4 1-D and 2-D coding, T.6 compression, JPEG gray scale and color modes. Image format conversion, although not specified by T.30, is an optional feature of facsimile service class 2 command sets. Binary file transfer (BFT), is a mechanism to transport aT.454 format file under error correction. Error Correction Mode memory can be maintained off-system.